Names have been changed to protect the identities of the individuals featured in this field dispatch. On February 3, six months after declaring a famine in several areas of Somalia, the United Nations announced that the famine was over. But the United Nations tempered its announcement with the sobering estimate that 2.3 million people in Somalia—a third of the country’s total population—still faced a food crisis. Ominously, forecasts of poor rains for all of the eastern Horn of Africa are prompting aid agencies to warn that famine conditions could easily recur in 2012. Learning lessons from what did and did not work in the 2011 famine relief efforts in Somalia is thus a matter of urgent and immediate concern. One of the areas where the needs were the greatest and the famine conditions the most persistent is the Somali capital of Mogadishu. But, seemingly incongruously, the area is also where the feeble Somali Transitional Federal Government, or TFG, has the most influence countrywide. As the drought intensified last year, the capital was inundated with some of the most vulnerable victims because Somalis living in rural areas fled there, expecting they would have the best chance of receiving assistance in the city. Because it was the destination for so many displaced people with no livelihood, the theory goes, Mogadishu has also been one of the slowest areas to recover. 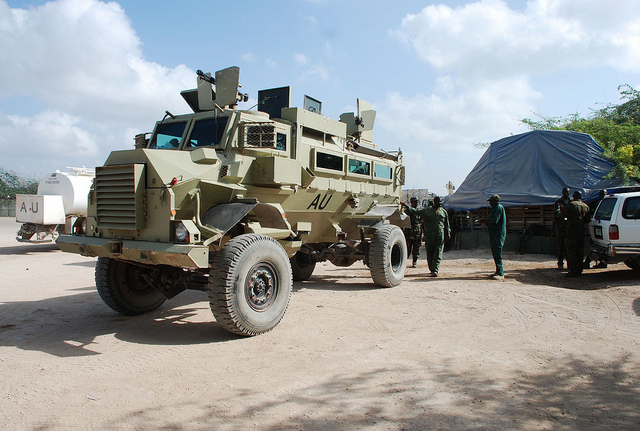 But as this field dispatch describes, insecurity, inadequate oversight for distribution of humanitarian assistance, and wholesale criminality combined to create a situation where beneficiaries often didn’t see the relief intended for them, security services involved in distribution committed abuses with impunity, and aid flowed instead into the pockets of corrupt Somali officials—all issues that primarily fall to the TFG to address. During a recent visit to Somalia’s embattled capital, the Enough Project gathered a variety of perspectives on how the famine relief played out at the most local level. Through a series of interviews, primarily in three settlements in the city where people displaced from other parts of the country have sought refuge, Enough documented testimonies that provide a candid look at the challenges to providing assistance in this city long steeped in vast quantities of humanitarian aid, where security conditions are such that a young man not prominently carrying a gun draws greater concern. Details of the individual testimonies are impossible to verify, but accounts we have selected to highlight are generally consistent with other interviews, information from Enough sources, and public documentation. A harbinger of what was to come, an influx of people fleeing drought arrived in Mogadishu in January 2011, just after the 2010 Deyr rains (October to December) failed, leaving farm lands parched in an area already chronically prone to severe weather. The U.N. estimates that 24,200 people arrived in the capital that month, compared to previous months when the U.N. reported population movement out of the city due to conflict. The vast majority of newly arrived reported leaving their homes due to drought and to “lack of livelihood,” which in the context of the failed rains was likely also tied to the severe weather conditions. But it would be months before warnings of an impending famine in Somalia were pronounced enough to make international headlines. Indeed, major media coverage only began in June 2011, a month before the U.N. declared famine. The U.N. refugee agency’s tracking of displaced people indicated that most came from the regions surrounding Mogadishu—Lower Shabelle, Middle Shabelle, Bay, and Bakool—notably all areas controlled by the militant group al-Shabaab at the time. 2011 saw a steady flow of drought-affected people arrive in Mogadishu, with a spike in July at the height of the famine. Last fall, the city was said to be hosting to an estimated 372,000 displaced people from other parts of the country. But that estimate was amended in January when new assessments concluded that the figure was overblown by a full 188,000 people. The conditions among those displaced were dire—and malnutrition and mortality rates among this population remain high—but the scope of the problem in Mogadishu, upon which aid agencies planned their response, was overstated. Controversy over the diversion of humanitarian assistance intended for needy Somalis has long plagued aid efforts in Somalia, most dramatically in recent years following the documentation by the U.N. Security Council-mandated Monitoring Group on Somalia of “large-scale” food aid diversion, primarily by contractors and local staff of the World Food Program, some with links to militant groups. In short, the monitoring group’s damning March 2010 report found that as much as half of aid sent to Somalia was being diverted. The U.N. Monitoring Group and subsequently some journalists have named names of the high-level conspirators in aid diversion. But even during a limited visit to Mogadishu the scope of the problem is apparent. In Banadir market, stalls in the dry grain area of the centrally located shopping center are filled with bags of food bearing the bright insignias of the some of the largest donors and aid groups: World Food Program, United Arab Emirates, People’s Republic of China, United States. But in the context of detailed reporting on the endemic siphoning off of aid, and the fact that food aid is one of the biggest “industries” in Mogadishu in sheer dollar amount, the stacks of grain for sale bearing the phrase “A Gift of the American People” is a poignant illustration. In an effort to discourage diversion and ensure the appropriate recipients consume the food intended for them, humanitarian groups often distribute “wet food” at “feeding centers”—a rather impersonal way of describing what is essentially a soup kitchen. The center Enough visited was open to anyone who needed food, according to World Food Program staff at the site, to prevent tension between members of the displaced community and the local residents. At the centers, the food itself is said to deter those who would abuse the system: specially formulated to deliver the most nutritional value at the lowest cost, the spoonfuls of porridge served out of vast cauldrons pack a nutritious punch but likely wouldn’t be the first choice of someone who wasn’t genuinely in need of a free meal. The day Enough visited the feeding center, the lines of people awaiting their bowl of porridge were overwhelmingly comprised of mothers and children. One mother, Surai, was waiting in the shade steps away from where her eight-year-old son Abdui was being measured for indications of malnutrition. Abdui’s eyes were sunken and his arms rail-thin. While he was being examined by the local health worker, Surai said that her other three children had stayed at the camp, giving the impression that Abdui was perhaps in need of special attention at the clinic because he was so frail. But as the conversation proceeded it was clear that the opposite was true. Of Surai’s four children, Abdui was the strongest and therefore came to the center to help his mother carry their light purple bucket of porridge back to his feeble siblings. At these local centers, the abuses come into play in the frequency of the feedings and the amount of food distributed. One source described to Enough a surprisingly simple but apparently effective way that some local aid organizations misrepresent the amount of food dispersed. The source said that local NGOs are expected to submit written reports and photos to donors like WFP documenting their distributions. But the photos presented as evidence of feedings taking place over multiple days are often compiled on just one day, with placards indicating the different dates swapped in. The Somali NGOs involved in misrepresenting their activities are well known locally; they are some of the oldest and largest Somali groups working in food aid “business,” the source said. The problem is exacerbated by the collusion of some third-party organizations assigned by donors to monitor and audit the local NGOs. The terms refer to an individual self-appointed to serve as the representative of displaced people, who often asserts his or her influence through connections with the neighborhood militia. In some cases the gatekeeper is one of the displaced, but the position is typically claimed by someone from the “host community” or neighborhood where the camp has sprung up. The gatekeeper serves as a point of contact for the aid organizations working in the camp and a liaison to the local community, and thus exerts influence over the displaced by wielding power to determine who receives assistance and when. Camp residents pay the gatekeeper, typically in food aid, to use the land (which may or may not actually belong to the gatekeeper) or stay in their good graces. Asked about how humanitarians operating in Mogadishu are working to combat the influence of gatekeepers, a non-Somali U.N. staff member presented them as a relatively benign presence. The source noted that the gatekeepers operate in a “murky network” but shrugged off the question of countering their role, explaining that they are simply part of the system long in place for distributing aid. But gauging from interviews with people who came to Mogadishu in search of assistance at the height of the drought and now live in makeshift camps, the gatekeepers are anything but benign. In August, Hawa decided to leave her home in the city of Jowhar in the Middle Shabelle region to make her way north to Mogadishu. Her crops of maize, beans, and sesame had failed in the persistent drought, so she and her four children walked for three days and then found a ride in a car for the final day of travel. In November, Hawa traveled back to Jowhar when she learned that her sister had died. She hoped to find that the conditions were improving so that she could begin making plans for her family to return home, but instead she found that floods had engulfed her land. So Hawa traveled back to Mogadishu but is eagerly awaiting news that that she can return home for good because she said the assistance she and those living around her have received isn’t adequate. “The NGOs bring the food, and then we don’t know what happens exactly, but the gatekeepers say ‘the food is finished,’” before the people living in the camp receive any. “The soldiers and militias are taking it, even those of the TFG,” Hawa said. She said that the normal allotment is one meal a day per person; the children receive porridge in the morning, and the adults eat cooked wheat at midday. Khadija’s left eye still showed signs of swelling when she was interviewed by Enough. Her temple was marked with a welt, the remnants of the whipping she received 10 days before when she demanded to keep her place at the front of the food line. The day before the incident, the food was gone before she received her meal, Khadija explained. So she went to the distribution site early the next day and was the first in line. But three hours later when the food distribution began, the man dishing out food, a member of a local militia, ignored her and called another woman to the front. Khadija protested. As she recounted the story 10 days later, Khadija became very animated; she was obviously still furious. “Then he whipped me, slaaack!” she explained, cutting the air and drawing her hand in front of her face where the whip hit. She missed her one meal that day as well, because the militiaman forced her away. Habiba’s weathered face gave the impression she was even older than her 64 years, already a very elderly woman by Somalia’s standards. But until last summer she continued to work on her tobacco farm to contribute to her large family’s livelihood. In July, her six daughters, three sons, and three grandchildren moved temporarily to Mogadishu after the militant group al-Shabaab burned the family’s tobacco farm as punishment for growing the forbidden substance. Habiba said her family had no choice but to leave when their loss of livelihood was compounded by the skyrocketing food prices, but she found the conditions in the camp depressing. Rather than survive on the meager once-a-day prepared meals, Habiba said she wished the aid organizations would distribute dry grains so that her family could cook for themselves. One month before, the Turkish aid organization working in the camp delivered bags of food for the gatekeepers to disperse. Habiba brought her bag of rice back to her family’s makeshift home and opened it to find that half of the contents had been stolen. “First they take something good out of the sack and then the put in sand. Soldiers do this,” she said. The same militiamen patrol the camp every day, so the displaced people know well who they are, Habiba said. But she added that they cannot raise the issue of the abuses with the TFG army because TFG commanders are working with the militias. “If any NGO comes here, they should give the food directly to the beneficiaries,” she said. The types of incidents described above are certainly not rare. Due to obvious security considerations that prevent staying in an unpredictable public space for longer than the span of a handful of interviews and make the cost of doing research in Mogadishu very high, Enough’s time spent in the camps was necessarily limited. 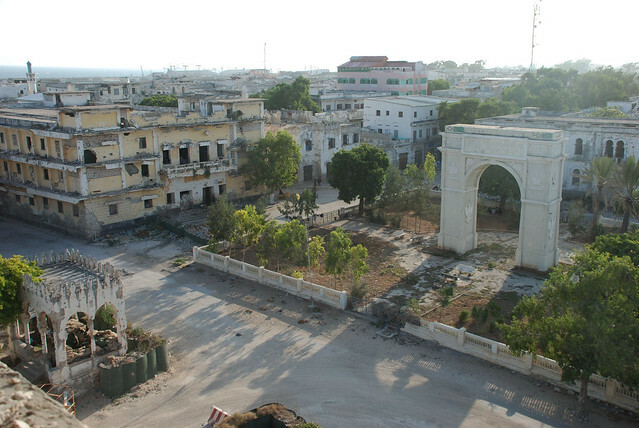 Nevertheless, our researcher learned of a variety of abuses, some of which are taking place just around the corner from the highly secured headquarters of Somalia’s transitional government. 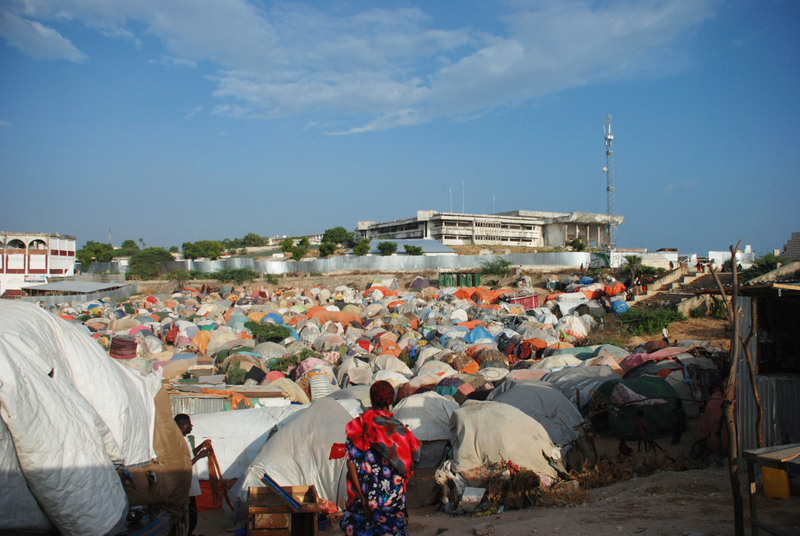 The dense patchwork of tents forming the Darwiish camp, where Hawa, Khadija, and Habiba live, covers the hill leading up to the imposing Parliament building, near the entrance to Villa Somalia, the seat of Somalia’s Transitional Federal Government, or TFG. 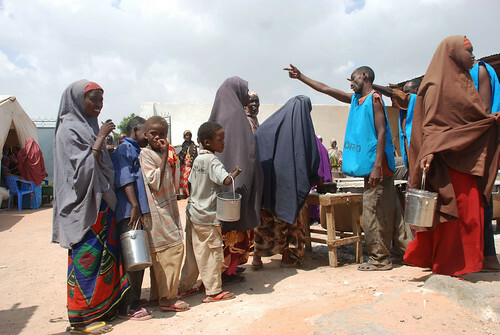 Set against the testimonies of these women, Prime Minister Abdiweli Mohamed Ali’s commentary on the famine looked particularly disconnected from the everyday reality of people struggling to find food. In a briefing with international journalists in Mogadishu in December—two months before the famine classification would be downgraded—the prime minister was asked why, as conditions improved in several famine areas and the classification was lifted, Mogadishu, where the government has the most control, remained a famine zone. 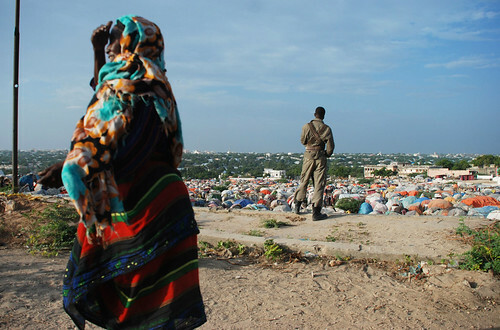 The prime minister’s frustrations are by no means unfounded; investigations and commentaries on the damaging effects of aid globally rarely fail to mention Somalia, where examples are rife from the past three decades or more. However, Abdiweli’s defensive posture and quickness to blame the humanitarian community for the obvious shortcomings of the Somali government reveal a stubbornness that is alarming coming from a government so short on credibility and capability. With just over four months left until the Transitional Federal Government’s mandate expires, a military offensive against al-Shabaab in full swing, and predictions of ongoing, widespread humanitarian crisis throughout 2012, Somalia’s leaders face one of the world’s most challenging governing environments. But if the TFG, or its individual members who have ambitions of playing a role in post-transition governance, have any hope of becoming a unifying influence, they must take ownership of the country’s challenges, including by sanctioning the individuals and systems in place that benefit from and perpetuate the misfortune of fellow Somalis. Where does all of this leave the international community? Recent attention to Somalia generated by the high-level conference in London in February and by the reported successes of joint military operations targeting al-Shabaab leaves the impression that important changes are afoot. There are. But without some dramatic changes in the way the country is governed and humanitarian issues are handled, Somalia remains prone to the next iteration of al-Shabaab, coming in to fill the void, and donors’ contributions to assist Somalis most in need continue to risk falling into the hands of those who benefit from Somalia’s chaos. “Changes in political leadership and decision-making structures will have limited effect if no effort is made to weaken the political cartels and networks that work behind the scenes in Somalia to divert funds and stymie effective rule of law,” wrote Somalia specialist Ken Menkhaus in a briefing for the Enough Project ahead of the London Conference. The international community has already expressed the view that there will be no more tolerance for the status quo. Now this wide array of actors—from multinational bodies like the European Union, African Union, Intergovernmental Authority on Development, and Organization for Islamic Cooperation, to individual country players like the United States, United Kingdom, Turkey, and the Gulf states—must present a united front and use their substantial combined leverage over TFG leaders and other signatories to the Garowe Principles to continue to press for meaningful reforms during the final months of the transition and in the coming years as Somali leaders work to build strong and independent institutions.